Ceremonial Pink Banarasi Silk With Fancy Crop Top in Gold Co..
Gorgeous Block Butti Print Work in Green Lehenga With Kediya..
Luxurious Banarasi Brocade Silk with Diamond Work in Pink Co..
Hypnotize Fancy Lehenga Fabric and Block Print in Chikoo Col..
Splendorous Banarasi Brocade Silk With Bhandej Print Red n G..
Summer Elegant Long Jacket With Lehenga in Yellow And Black .. Glamorous Brocade Silk Beige And Dark Pink Lehenga Choli Wit.. Dazzling Orange Banarasi Brocade Silk With Brocade Dupatta i.. Resourceful Patola Print With Patola Silk Multi Color in Dhu..
Super Duper Patola Silk Lehenga And Raw Silk Choli in Multy .. Awesome Banarasi Viscose With Weaving Print in Orange N pink.. Marvelous Patola Silk lehenga and Raw Silk Choli in Multy Pr..
Amazing Patola Silk Top and Georgette Lehenga in Black N Red.. Excellent Dhupion Silk Top N Georgette Lehenga in Black Colo.. Awesome Embroidered Banarasi Art Silk Lehenga in Light 3shad.. 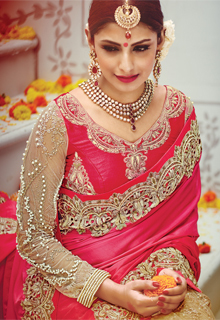 Brilliant Banarasi Silk Lehenga And Dupion Silk Choli With B.. Outstanding Banarasi Silk Lehenga in Orange And Hot Pink Col..